7.30pm-10pm every Tuesday. Visitors are welcome to our rehearsals, but please let us know you're coming along. Turn left out of the station and go under the railway bridge. At the traffic lights, turn left into Noke Drive. The School is at the far end of Noke Drive. Take the A23 towards Redhill. At the roundabout take the first exit (Princess Way) signposted A23 Gatwick. At the next roundabout (Redhill station on the left) take the first exit signposted A25 Godstone and go under the railway bridge. At the traffic lights turn left into Noke Drive. The School is at the far end of Noke Drive. Take the A23 towards Redhill. At the roundabout, take the second exit (Marketfield Way). 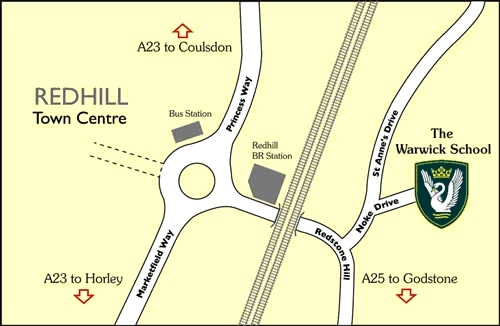 At the next roundabout (Redhill station to the right) take the third exit signposted A25 Godstone and go under the railway bridge. At the traffic lights turn left into Noke Drive. The School is at the far end of Noke Drive. There is ample parking in the school grounds.